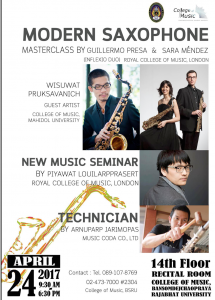 In the past few years, we have curated several new music events, including concerts, workshops, and masterclasses for young musicians in Thailand, and also concerts in Europe. 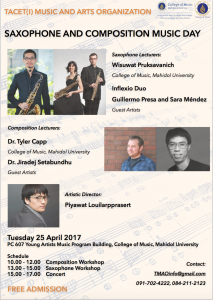 Last year, we established the Thailand Music and Art Organisation (2016) – its aim is to create and promote contemporary music and art internationally. 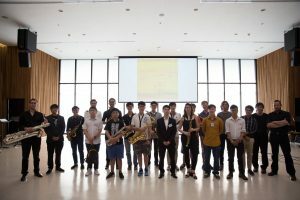 It also supports Thai musicians and young artists, enabling them to collaborate with international artists and take part in music festivals. 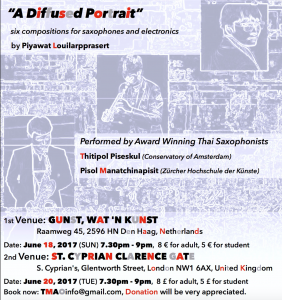 Past events include the TMAO Music Day: Saxophone and Composition Workshop 2017 at College of Music Mahidol University, Thailand, public concerts in the Royal Academy of Music (UK), Royal College of Music (UK), Saint Mary-at-Hill Church (UK), and GUNST, WAT ’N KUNST concert avenue in Den Haag (NL), from March – June 2017, Diffused Portrait Concert at St. Cyprian Church, London 2016, TMAO music lecture in Bangkok December/January 2018-19 and the upcoming project is “Beyond the Boundaries”, Thailand New Music and Arts Symposium 2019 in June at Bangkok Arts and Cultural Center.